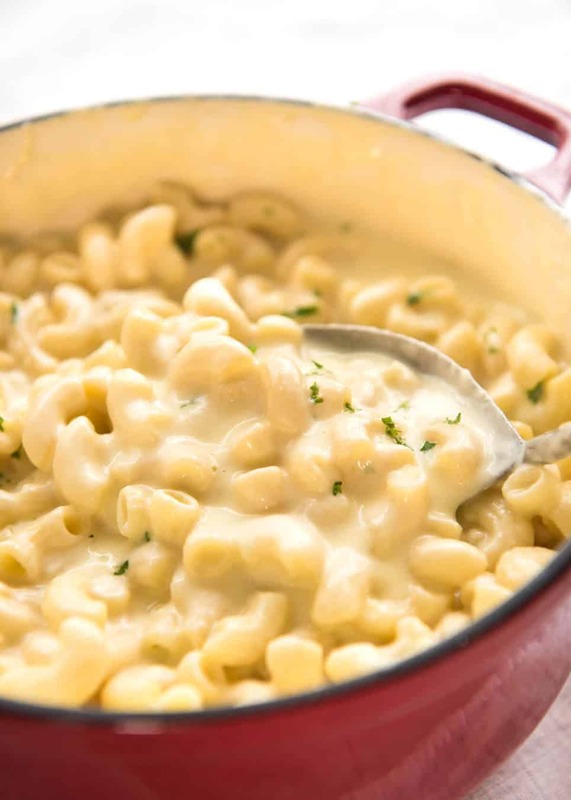 A silky, glossy cheese sauce with tender, never mushy macaroni in just 20 minutes! 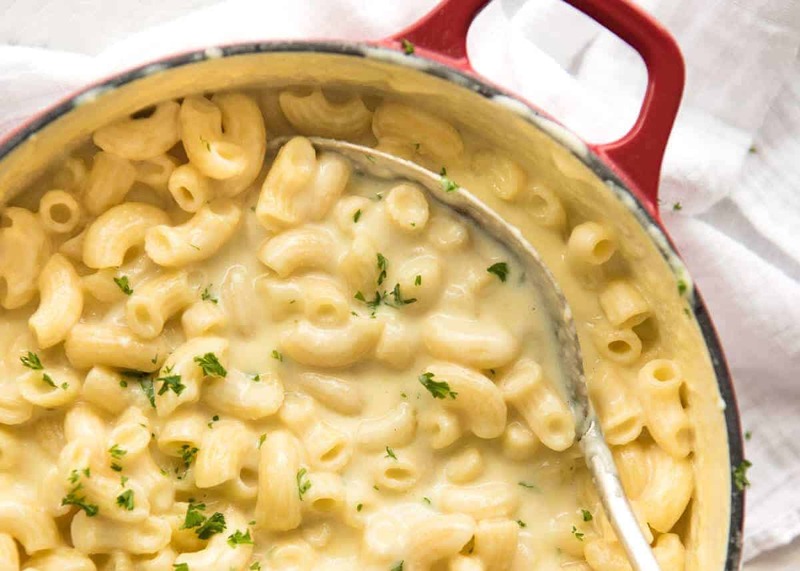 This stovetop Macaroni and Cheese is a perfect classic – and it just happens to be made in one pot. Butter, flour, pasta, milk, cheese and a few seasonings is all you need to make this epic classic that’s on the table super quick! Of all the versions of Mac and Cheese I have, this Stovetop Macaroni and Cheese is the one that I use most frequently because the effort vs output is off the richter scale. It would be easy to assume that I make this in one pot for convenience. But I swear to you, that’s not the reason why. Less washing up is a side benefit. 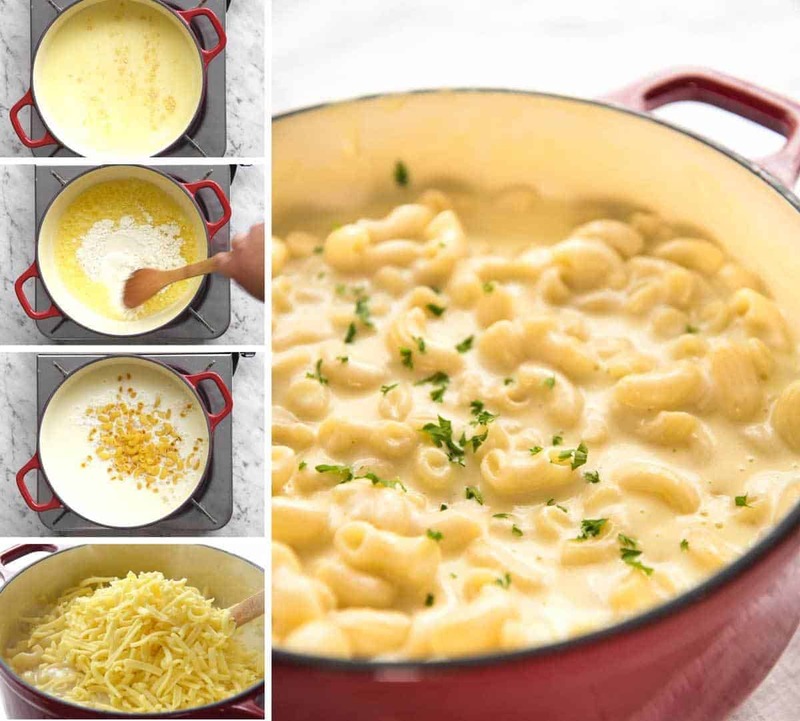 The reason I make this in one pot is because the starch released from the pasta mixes in with the sauce and emulsifies it, creating a cheese sauce that is silkier and clings better to the pasta than making it the traditional way (i.e. cooking the sauce and pasta separately). And by applying this same technique to Stovetop Macaroni and Cheese, the sauce comes out really luscious. Silky and glossy, and it clings to every macaroni. No gluggy sauce!!! It starts with a traditional roux made with melted butter and flour which is the thickener for the sauce. Add seasonings, milk, cheese, then add the pasta. And it all cooks together at the same time! Because the sauce thickens as it cooks, it needs to be stirred frequently. Not constantly, but pretty frequently. A leisurely stir every now and then, taking a sip of wine in between and flicking through a magazine. I thought a cooking video would be especially useful for this recipe so you can see the thickness of the sauce when you take it off the stove. If there is one tip I’d give for Mac and Cheese – any Mac and Cheese, even baked ones – it’s this: take the sauce off the stove BEFORE it’s the consistency you want. The sauce continues to thicken as you stir it and serve it. And it thickens really fast. So take it off the stove earlier, and if it’s still too thin for your taste, pop it back on later. I know there are many fancy schamcny Macaroni and Cheese version “out there” in this big wide world. Truffled, Lobster (yes, really! ), multiple types of cheeses, loaded with cream. The list goes on and on. And I’m definitely partial to playing around with Mac and Cheese myself. 1 minute cooking video tutorial. Dozer fans – don’t miss him bombing the shot at the end! Recipe video above. 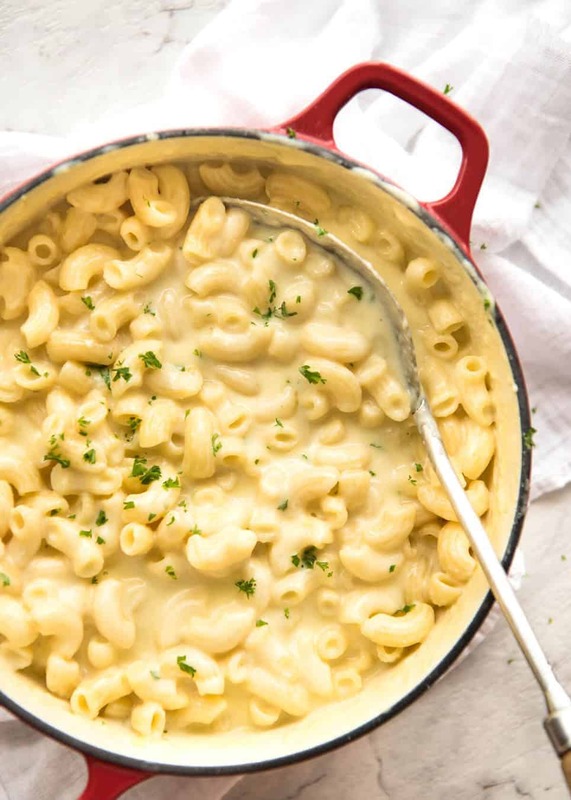 This classic Macaroni and Cheese just happens to be made in one pot! 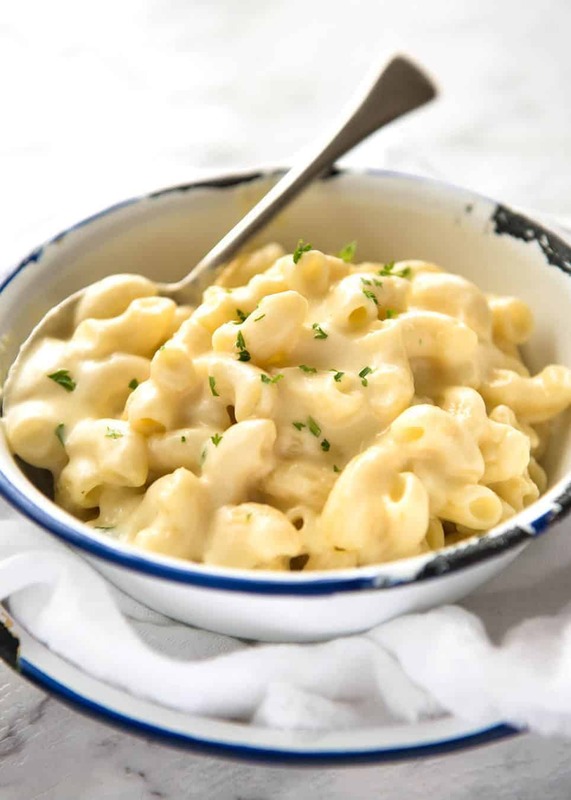 Though made with the usual ingredients, the sauce is extra silky and glossy, and it clings to the macaroni without having to make make the sauce super thick because the pasta is cooked in the sauce. So there's no risk of gluggy Mac N Cheese or overcooked pasta. Melt butter in a medium pot or large saucepan over medium heat. Add flour and cook for 1 minute. Add about 3/4 cup of milk and mix into butter mixture - it will become a slurry pretty quickly. Add remaining milk and mix so the slurry mixes in. Then add water and Seasonings. Add macaroni and mix. Stir occasionally as it comes to heat. 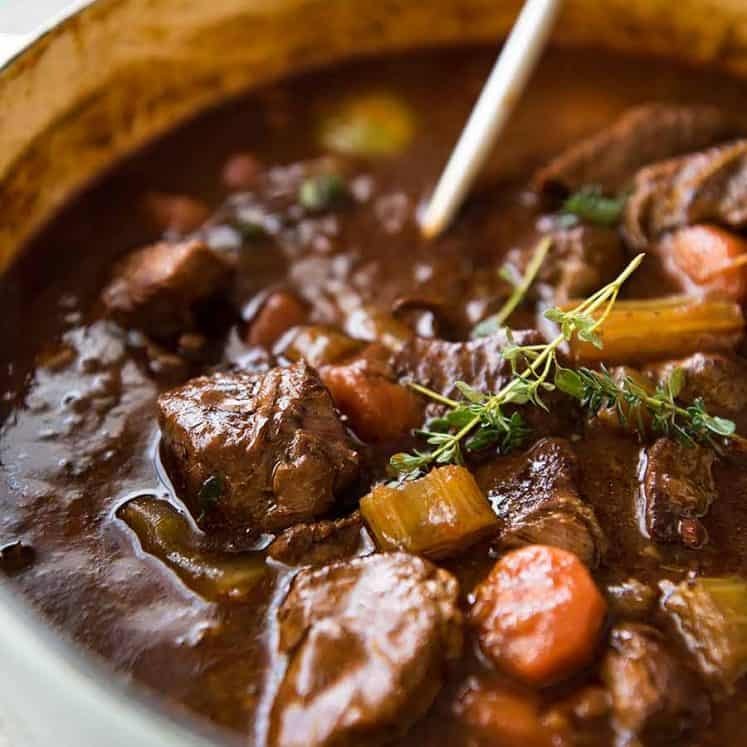 When you see wisps of steam as you stir, lower the heat down to medium low. Stir regularly as it cooks for 9 - 10 minutes (it will bubble gently), or until the sauce thickens and the macaroni is just cooked - tender but still firm. It should still be saucey at this stage and thinner than you want. Take it off the stove and stir the cheese in quickly. Adjust salt and pepper to taste. <- In this step, the sauce thickens and reduces considerably. 1. I like to use a mix of mozzarella (because it melts so well) and some cheddar or tasty cheese for flavour. But you could just skip the mozzarella - I don't recommend using just mozzarella (not enough flavour). Other options: Gruyere, Colby, Monterey Jack, Pepper Jack, Provolone can be used in place of the cheddar. AUSTRALIA: Do not use Tasty Cheese! I have found that some brands can result in the sauce being a bit floury. Some are ok, some are not - safer to say don't use Tasty Cheese! 2. This recipe is pretty forgiving as long as you take it off the stove before the sauce reduces so much it disappears! The liquid to pasta ratio is such that by the time the liquid reduces down to make a sauce, the pasta is just cooked. * Pasta keeps cooking in the sauce after you take it off the stove. So take it off when it is still a teeny bit firm! * The sauce thickens ALOT after you take it off the stove when you stir the cheese in and simply by stirring it. It is better to take the pot off the stove too early than too late. * If you take the pot off too late at the sauce becomes too thick, just add a splash of milk or water. Easy fix! * If you take it off too early, just pop it back on the stove. 3. I make my stovetop Mac and Cheese in one pot because I think it comes out better, using just the traditional ingredients. The reason is because the starch in the pasta releases into the sauce as it cooks, making it silky, glossy and it clings to the pasta. This is a technique used by Italians for all their pastas. Read more in the post! 4. My Baked Mac and Cheese is made differently, but you can bake this one too. Mix panko breadcrumbs with butter and parmesan, take the pot off the stove before it's done but enough sauce has reduced so the breadcrumbs will stay on top, then pop under grill/broiler for a few minutes. During this time the pasta will continue to cook. 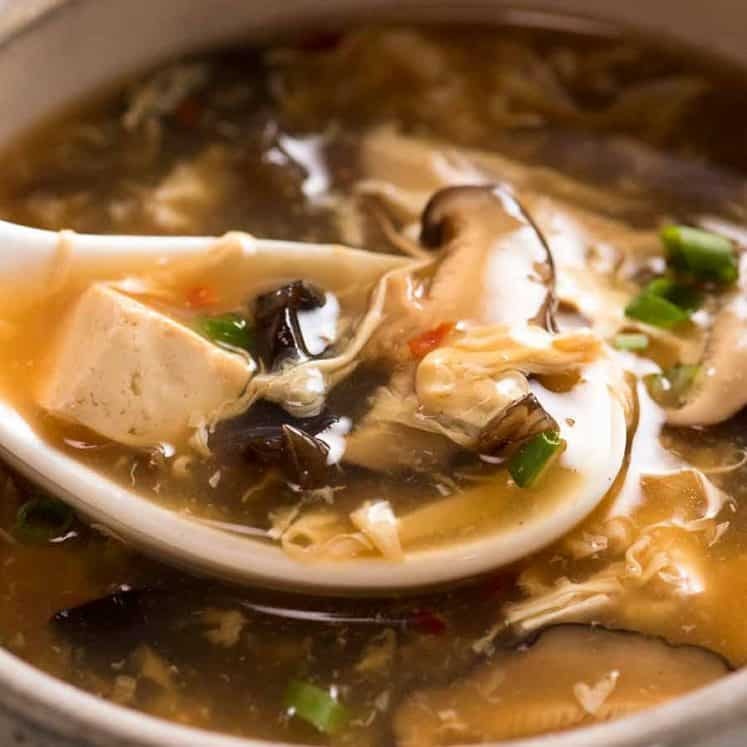 This recipe is very forgiving so don't stress if your timing is a bit out! 5. 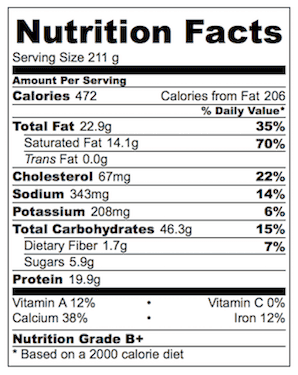 Nutrition per serving, assuming 5 servings. I only use a pinch of salt in this because I find the cheese is salty enough. 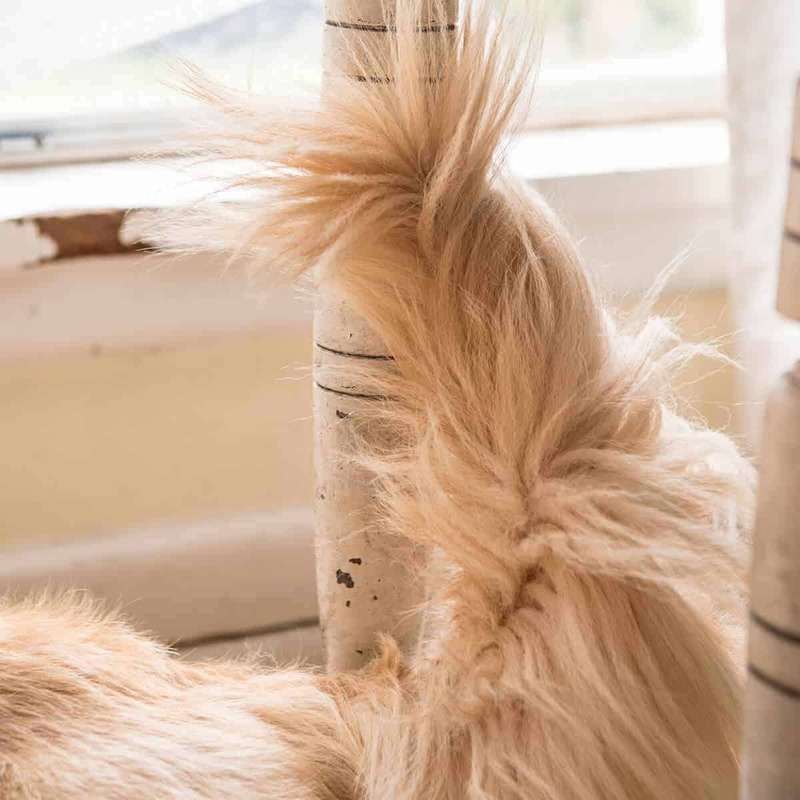 His tail gets in all sorts of trouble. It can clear a coffee table of wine glasses, brush through cheese platters. 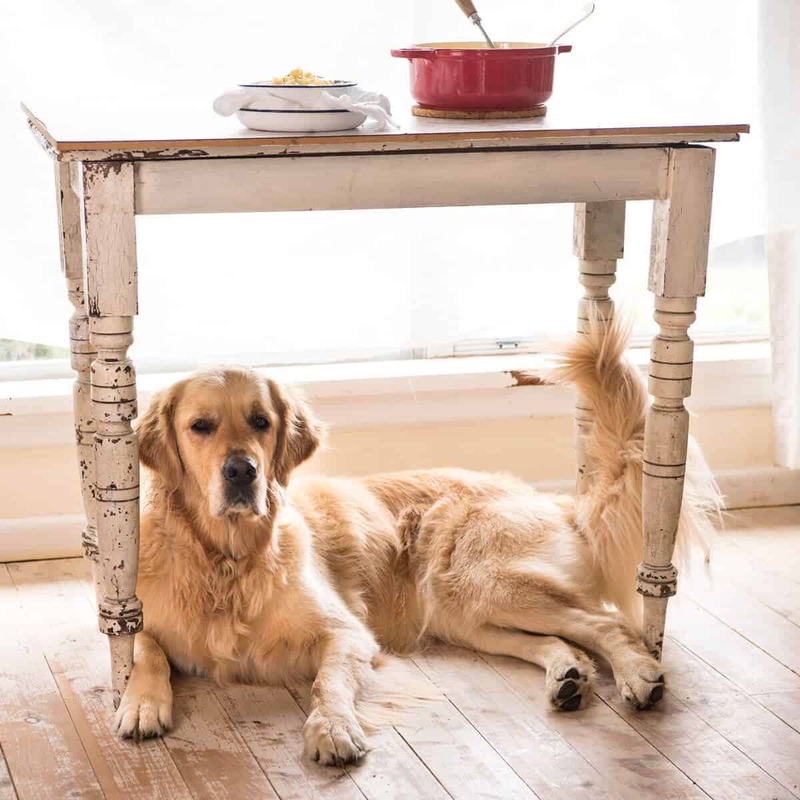 And gets caught in things like a crack in the leg of this table. The perils of having long hair, hmm? Also am going to add some smoked sausage to make it into a meat casserole. Great recipe. I also added worchestershire sauce and a bit of sriracha seasoning. Just my preferences. Added all the other seasoning suggestions. Very Good 👍! !